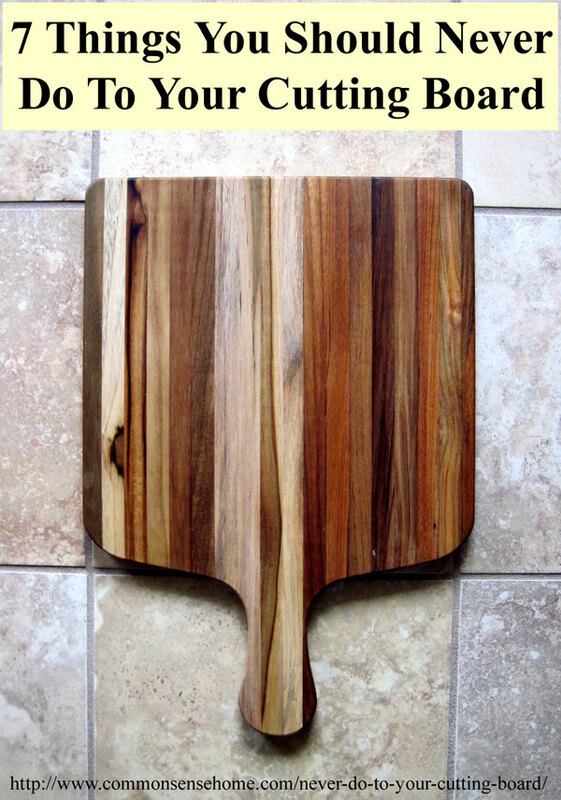 In 2013, I reviewed a gorgeous, sustainably harvested cutting board from Proteak. They've recently relaunched their Marine Collection of cutting boards, and asked if I would like to share them with all of you again. You can read the full review of Proteak and the Proteak Cutting Boards to learn about teak, where the wood is grown and the company's commitment to environmental stewardship. Since they've taken steps to produce a quality produce that lasts, I figured it would be a great idea to share the things you should never do to your cutting board to help it stay beautiful for a lifetime of service. Never let your cutting board get extremely dry, or place on or near excessive heat (such as a stove). They are wood, and can burn. Even if they don't catch fire, excessive dryness can cause cracking or breakage. Never leave your cutting board to soak or sit wet. Extreme humidity can cause the wood to swell, weakening the structure of the board. Putting a wooden cutting board in the dishwasher is just completely and utterly a bad thing. Never cut continuously in the same place on your cutting surface. Distribute your cutting over the entire work surface so that it will wear evenly. Never use only only one side of the cutting board. Turn your cutting board over periodically to allow even usage to both work surfaces. Never use a razor-edged cleaver. This can chip or splinter the wood and produce soft spots. Your cleaver should have a duel sharpened edge for best results. Never leave your cutting board sitting dirty after cutting meat. Always wash the block thoroughly in warm, soapy water after cutting fish, red meat or fowl on the work surface and allow to air dry well before storage. Never cut off ends, drill holes, make cutouts, or otherwise deface surfaces without refinishing the exposed unfinished wood. Not only would you void your Proteak guarantees, you'd be defacing a work of art. 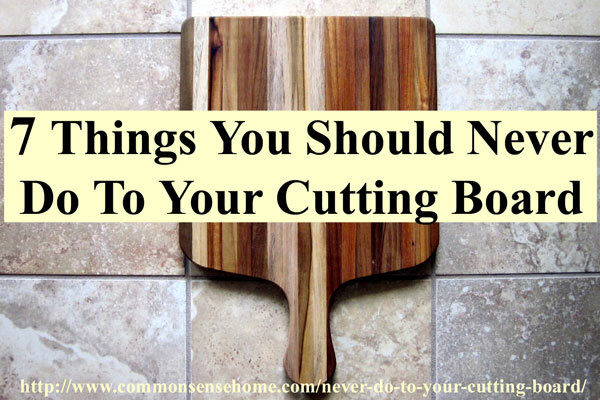 To learn how to care for your cutting boards, you can visit the post, “Why Wooden Cutting Boards are Best“. With proper seasoning and care, a good quality cutting board can last for years, and may even become a family heirloom. They also make beautiful yet functional gifts. Bought two to give one away and they love it as well. I love my Proteak cutting boards. I would use it to encourage my daughters to help more in the kitchen and learn more about cooking. What a beautiful cutting board! And great tips! I think #3 is the hardest for me! I would give one of these to my husband. He is the hottest cook! Wow. Thanks for the tips! I would use this beautiful board as a cheese platter. This board would get lots of love in my kitchen! It would be perfect for cutting up fruits and veggies. Love wood! I like the chop and slide board in the Marine collection. It’s so pretty, I would serve fruit, crackers, and cheeses on it! I would use it for my fruits and veggies to make delicious vegan meals. such a gorgeous cutting board!! I have been wanting one of these! i always coat my wood utensils and boards with walnut oil, brings out the beauty and protects them. I like gourmet or rectangular edge grain. I would use it for making dinner. Can you tell me if this brand of cutting board is nontoxic? I was reading about how wood boards are held together with toxic glues and sometimes have a oil finish that isnt healthy. Ive been looking for one that is as nontoxic as possible. These boards are beautiful, but i have a very sick child and have to be very diligent with all things when it comes to toxins. Thanks! I can double check with the manufacturers, but I can’t imagine they would go through such care to produce the wood only to bind it together with toxic glues. The surest way you could guarantee what your getting would be to buy a solid piece of wood from someone you trust and cut it to the size you need. I still have the cutting board I made in junior high school. Such an attractive cutting board…I would leave on the counter for all to see! I love the RECTANGLE EDGE GRAIN CUTTING BOARD WITH CORNER HOLE AND JUICE GROOVE 18 X 14 X .75 especially because of the grooves for juices dripping and the hole for hanging, plus it’s a nice, large size. I cut a lot of meats and have destroyed many a cutting board, but after reading your rules I see what I’ve done horribly wrong all these years. And yes, I even caught one on fire. I hope to redeem myself with a new cutting board, possibly as a winner in your contest! My mom scorched a cutting board I made in junior high school. It was shaped like a pig, and she gave it a brand on its backside with the stove burner. I would use this cutting board for everything! It’s gorgeous. I currently have a plastic one that the works well enough but I’ve been wishing for a quality wooden one for quite a while now. The one pictured in this post is gorgeous!!! From their website I love the “RECTANGLE EDGE GRAIN CUTTING BOARD WITH CORNER HOLE AND JUICE GROOVE”. I’ve never own your product and would love to. It is what it is, I have bought so many “cheap” cutting boards, it would be nice to have a good quality one! I only use my cutting boards for cooking/baking. Cutting veggies, prepping meats, making bread dough and pie crust, etc. Thank you for this opportunity! Beautiful cutting boards! Would have to display this between uses. Would love to win! I never have enough cutting boards. I would use the cutting board for all the nice fruits and veggies I get from my garden. There are SO many ways to use this. I make absolutely everything from scratch. Love to cook, garden. Love everything about food and the kitchen and garden. I think if I won this one, I might dedicate it strictly to meat. Both my husband and I use cutting boards daily: he when he makes his breakfast, and I when I am making dinner, so I guess my best answer would be that I would use it for chopping whenever I cook! I am impressed with the look, quality and price of the boards they have! It’d be great to replace my plastic cutting board with one of these. I’d even clean fish on it. I would use this board to cut up the vegies from my garden and the fruits too! I’ve never heard of Proteak before, but that board is beautiful! Thanks for sharing this! My favorite is RECTANGLE EDGE GRAIN WITH CORNER HOLE & JUICE GROOVE – I have recently turned to eating fruits and veggies and living alone. Have to have goodies cut in a “quick grab” form or I find junk easier to eat. It would be used for cutting portions of fruits and veggies and preparing for canning. I thing the groove would be great to catch the watermelon (melons juice) for drinking and the fruit for canning or just eating. same with veggies. Thank you for the entry and “great chopping” every one!! I received my cutting board today! It is beautiful. Now I just have to convince myself to actually *use* it, and not just show it off as art, lol! Would love the Gourmet Chopping board or even the Rectangle Edge Grain Cutting Board with Corner Hole and Juice Groove. I love using a wooden cutting board. There is a rare meal that I do not use a cutting board. Number five is an oximoron. “Dull sharpened” are you saying I should purposefully dull my knifes??? Yep, it probably makes more sense now that I changed the “l” to an “e” like it should have been in the first place. 7 nevers was good information. In reviewing the information on tips on the Teak website it was very helpful to know to clean the cutting board with vinegar and baking soda, salt and lemon or hydrogen peroxide. I never knew that. I believe I have one of their larger cutting boards that I was lucky enough to find at a yard sale for a really good price. I like the idea of purchasing their soaps and oils for keeping all cutting boards in great condition. Good luck to all that entered to win, as I did not. I would use one for meat and another for produce. I love these butcher blocks. Hard to decide which one to choose. I use them for cutting wild game and other meats, cutting veggies. Presentation boards for cheese tray or other appetizers. I could own all of them and still use everyone tons of times. They are simply beautiful in addition to being extremely useful.